Industrial vending machines are changing the way that users interact with the storeroom and spare parts supply function. Typically, the rationale for the use of vending machines is tied to the potential for cost savings achieved through greater issuance control. However, following a recent virtual round table session, one of our members kindly agreed to share the following case study about the real-world application of spare parts vending machines at a western Canadian refinery. The author of this case study has chosen to remain anonymous, but the following are their own words. My motivation for installing vending machines was more to do with transaction reduction at the warehouse counter than anything else. My analysis of the transaction history determined that material items that amounted to less than 1% of inventory value created more than 80% of the daily transactions. Our counter was as busy as a pub on a Friday night, well maybe not quite but for sure a Wednesday or Thursday. The push-back I got was primarily to do with a years-old belief that vending machines did not provide adequate reporting and that all inventory needed to be tracked and recorded using our ERP system, SAP. We are talking there about the minor stuff: gloves, Teflon tape, safety glasses. Things that provide no added value to the work but are needed anyway. Our business unit is remote to the main organization and most of the policies we have to live by are driven by what the folks in the main organization believed. Often what we wanted to do did not make sense to them. They did not face the same financial constraints that our unit did, so they did not understand our need. 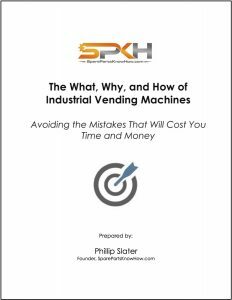 From an abuse/cost savings perspective, I did not see that there would be the 20 to 30% cost savings that is often thrown around as a benefit of installing vending equipment. Our folks use what they use and, with or without vending machines, they were still going to use it. The big win was time: time for the stores staff to focus on managing the inventory at hand. In addition, there was a corporate drive to reduce the stores personnel from 2 people to 1 person, so to make that work we really needed to reduce the transaction load. The vending machines did that. Not entirely, of course. We had to improve our planning and scheduling so that the warehouse staff knew what they needed to kit each week for the next week’s work, and we continue to work to a 2 or 3 week outlook. 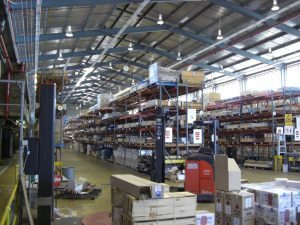 However, the drive to operate with a single warehouse staff member was achieved. I did not do this alone. Fortunately, a person was hired in our main organization that had experience in a past life with vending. They were also put in charge of consignment inventory. So when we got talking and I mentioned vending, they wanted to know what I thought. I sent my research and vendor details and within 6 months our business unit was installing a coil machine and 2 locker set ups. Within 6 months of that, 3 other business units had been set up with vending systems and more were looking at them. Now, they are just a daily part of business.